Rwandan defender Bayisenge Emery completed a two-year contract move to Bangladesh side Saif Sporting Club where he will stay until 2021. 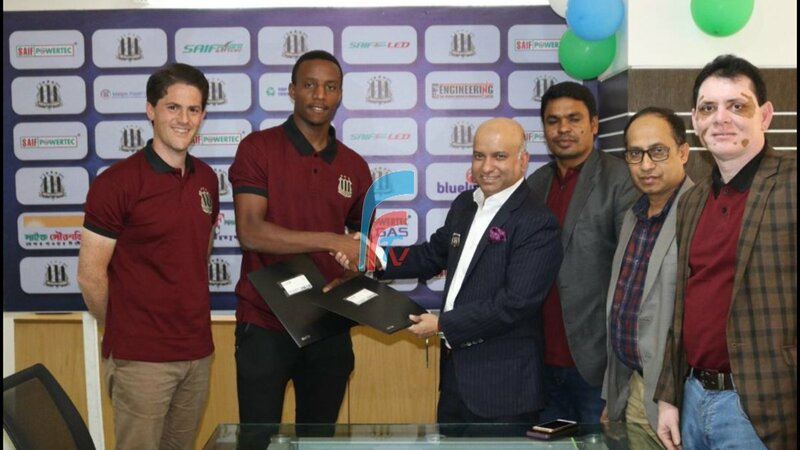 Rwanda international defender Emery Bayisenge has penned a two-year contract deal with Bangladesh Premier League side Saif Sporting Club. The former Isonga and APR central defender signed the contract on Thursday in company of the club administrators and former Amavubi coach Jonathan McKinstry who is managing Saif Sporting Club. Bayisenge who will feature for Saif Sporting Club until 2021 had been club-less for six months following his unsuccessful stint with Algerian giants USM Alger. According to reports, Bayisenge was signed to a tune of USD $26,000 and will be earning USD $10,000 as a monthly salary. Bayisenge was one of the most influential players in Amavubi during McKinstry’s tenure as head coach. He is best remembered for guiding hosts Rwanda to quarter-finals of the 2016 African Nations Championship (CHAN) finals tournament. Bayisenge captained the U17 Amavubi starlets that competed at the 2011 FIFA U17 World Cup in Mexico, and has since risen through the ranks rapidly, making his full Amavubi debut in 2012. The celebrated center-back has 37 international caps to his name.